Our Stainless Steel “Wok Sink” comes in three sizes 14″, 16″, & 18″ in diameter and currently sells through Comet Studios for $1,800.00, plus shipping. Our “Wok Sink” is polished on the inside and brushed on the outside. The “Wok Sink” comes complete with a drain assembly and collar tie without an overflow drain. 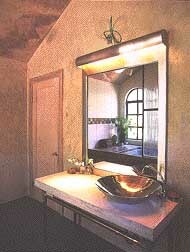 We can fabricate the sink in brass or copper for an additional fee. Production time is currently 4-6 weeks from receipt of your check for the prepaid full amount to delivery. We have sold our sinks all around the country. So far our clients reside in more than 25 different states and in Canada. Our main business is Architecture, specializing in environmentally conscious residential design as well as furniture and domestic objects. We have received architecture commissions around the country and in Brazil from initial inquiries on our “Wok Sinks” and our web site. We have worked with clients on designing bathrooms that utilize our sink, remodels and new construction from cabins to estates. Our work is innovative, energy efficient and cost effective, with an emphasis in designing homes that realize the clients’ dreams, needs and aspirations. While we no longer manufacture our Wok Sink, we thought we should share our innovative design which was first introduced in 1993.